Even if you're not a big Lantern fan, you probably know a thing or two about the rivalry between the Green and Yellow corps. Like galactic oil and water, the lights of willpower and fear have been butting heads across the cosmos for a long time. But there's more to the war between these two colors than just opposing ideologies—this bad blood is personal. And no one understands just how personal it really is better than Soranik Natu. Now, if you're just joining the Lanterns with HAL JORDAN AND THE GREEN LANTERN CORPS, you've probably only known Soranik has the leader of the Sinestro Corps. That's been her role for a while now, but it was wasn't always the case. In fact, once upon a time, Soranik was a high-ranking member of the Green Lantern Corps. So, what happened? Where did Soranik's story take such a stark turn? How do you go from fighting against your father's legacy to embracing it completely? Well, to start off, the fact that she's Sinestro's daughter is a pretty big piece of the puzzle. But here's the thing: Soranik lived most of her life not knowing the truth about her father. On her home planet of Korugar, she was raised by adoptive parents without ever realizing they weren’t her biological mom and dad. Even worse, she was initially heavily indoctrinated into the Korugarian way of thinking—that the great, renegade lantern Sinestro was in fact the rule, rather than the exception, and a symbol of the Lantern Corps corruption and oppression. Korugar actually developed a track record of branding anyone who accepted a ring after Sinestro’s actions as a traitor to their people, so you can imagine Soranik was less than thrilled when a ring came knocking at her door one day. She actually tried to reject it all together, but, as she was quick to learn, avoiding your destiny is something you can only do for so long. Initial misgivings aside, Soranik actually came to deeply enjoy her life in the Corps. She learned the real story of Sinestro over time, thanks in part to working closely with Hal Jordan, Sinestro's former partner, and was able to overcome multiple instances of great fear and panic to prove her worth as a Lantern recruit. Of course, it all couldn't last. With the coming of the Sinestro Corps War, and the return of Sinestro himself, Soranik's history, and the history of her planet as a whole, was fast to catch up to her. She now had to face Sinestro directly, rather than just grapple with his legacy—and when push finally came to shove, she lost the fight. But, strangely enough, Sinestro spared her life, despite the fact he could have very easily ended it then and there. The reality of that moment didn't surface until much later, when Soranik was forced to come up against Sinestro yet again. This time, he wasted no time in dancing around the truth of the matter: he confessed to being her real father, and that he had her hidden away after her birth thanks to the rising distrust and concern about his status on Korugar. Soranik took this reveal about as well as you might expect, which is to say not well at all. She kept the truth secret for as long as she could, and managed to commit herself wholly to the efforts of the Green Lanterns in an attempt to spite her father and his legacy as best as she could even through the events of FLASHPOINT and the start of the New 52. Here's where things start to get messy. The dawn of the New 52 left the Sinestro Corps in disarray with Sinestro himself missing, so his long time right-hand-man, Arkillo, did what any megalomaniacal monster would do in a time of crisis and kidnapped his former boss's daughter. Arkillo stole Soranik away from the Green Lanterns and imprisoned her, believing her to be the last possible link to the true lineage of Sinestro himself. It was a complicated and unpleasant position to be in, especially considering Soranik's less-than-warm regard for her father. Naturally, things got even worse when Sinestro himself was resurrected, forcing yet another uncomfortable father-daughter "bonding" moment between the two of them. The upshot being that Sinestro's time away seemed to have reoriented his priorities, if only slightly, so rather than keeping Soranik locked away in a cage, he instilled her as the official Green Lantern emissary to the Sinestro Corps. She didn't get to keep her new job for very long, however. Soon after, a cosmic threat began to literally erase Green Lanterns from the galaxy. So, either to prevent Soranik from disappearing with her comrades, or because he saw an opportunity and an excuse, Sinestro stripped Soranik of her Green ring and made her a Yellow Lantern officially. No one in the galaxy does bad blood or grudge matches quite like the Lantern Corps. Of course, the story doesn't actually end there. You can see just how well Soranik's position in (and eventually leadership of!) 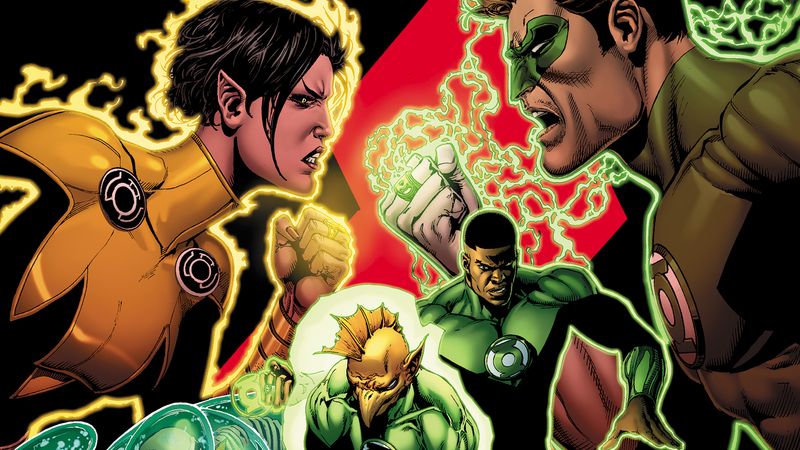 the Sinestro Corps goes in HAL JORDAN AND THE GREEN LANTERN CORPS VOL. 4: FRACTURE, in which the alliance she managed to forge with the Green Lantern Corps goes tragically awry, and a relationship that many consider to be one of the best in the Green Lantern universe comes to a shocking end. It’s just the latest chapter in the life of one of the most intriguing characters to ever pick up a ring…and then, to pick up another one. HAL JORDAN AND THE GREEN LANTERN CORPS VOL. 4: FRACTURE by Robert Venditti, Ethan Van Sciver, Rafa Sandoval and Jordi Tarragona is now available in print and as a digital download.